Three "flying sculptures" designed by Austrian artist André HELLER. Pictured from left to right are "Dream Lab", "Moon" and "Dragon Fish". 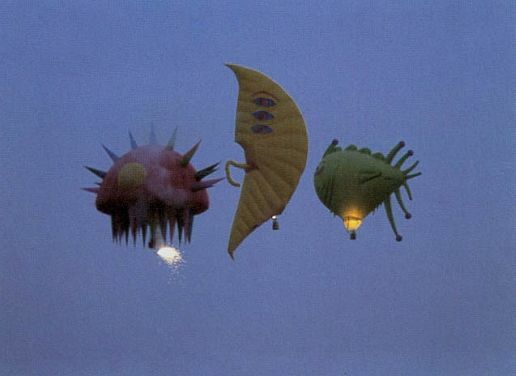 All three balloons were part of the "Flying Sculptures Project" which took place between August 1986 and August 1987. During this period, these and other artistic hot air balloons created by HELLER, were flown over 60 cities in Europe, Japan and North America. See also the next two pictures.